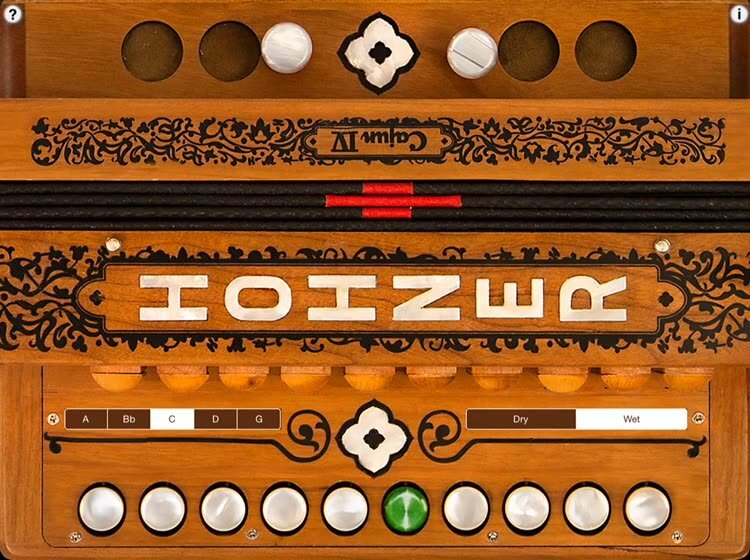 Exactly matching the layout of Hohner's new Cajun IV diatonic accordion, this intuitive virtual accordion app feature a super responsive, one-row fingerboard that plays and sounds like the traditional instrument. 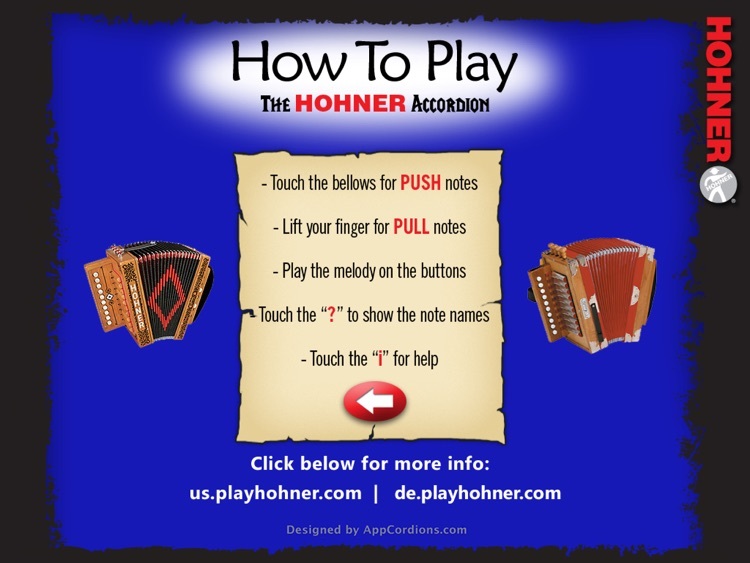 This virtual accordion plays in the most common key for Cajun music of C as well as in A, Bb, D, and G for those playing Zydeco or other styles of music. Both the treble and bass/chord sides of the instrument are provided. The Hohner Cajun SqueezeBox allows musicians to practice chord combinations, scales, and songs on-the-go. 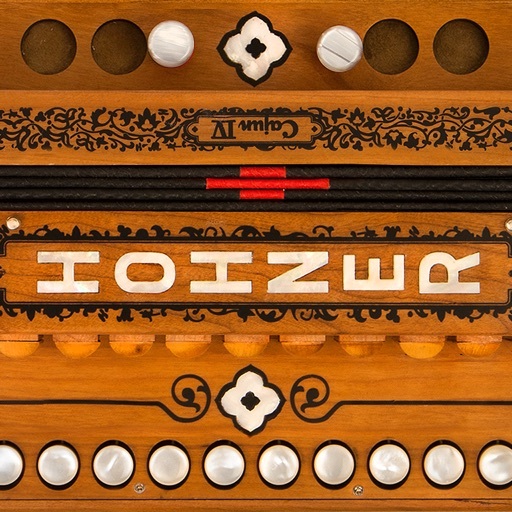 Headphones can be used for private practice, or the audio output of the virtual accordion can be amplified by plugging into computer speakers, or other sound enhancing devices. With the touch of a button, the tonality can be changed from a "Dry" three-reeds-per-note (LMH) sound to a "Wet" four-reeds-per-note (LMMH) sound. To play, simply touch the buttons. 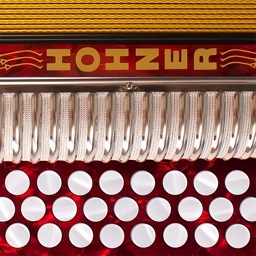 This type of accordion plays different notes on the push or pull of the bellows. 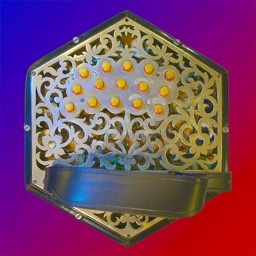 To switch between bellows push and pull, just touch anywhere in bellows or bass side. Touch to switch to push notes, lift to switch to pull notes. 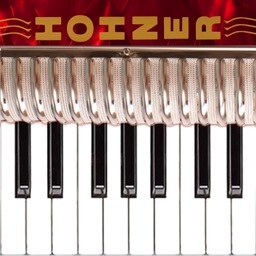 When playing the bass-side buttons, you can touch between the buttons to operate the bellows. Since you may want to play chords and melody with more than 4 fingers on the screen at a time, you must disable "Multitasking Gestures" in the iPad Settings. Run the Settings app, go to "General / Multitasking Gestures" and turn them off. Touch the '?' icon to show the note names for each button. 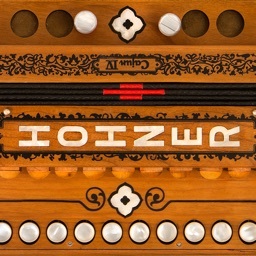 Note names shown are based on the C tuning.